balance or their ability to remember what they are doing and the best way to perform certain movements. But exercise does not have to be intense or complicated to be beneficial. In fact, a study conducted by Art Kramer, a neuroscientist at the University of Illinois, suggests that exercise is one of the best things people can do for their brains. Kramer scanned the brains of 120 older adults. Half of these adults performed an aerobic exercise program 3 days a week for 45 minutes per day which consisted mostly of walking. After one year, the participants underwent another MRI scan. The findings were remarkable: the brains of those who performed aerobic exercise increased in volume while the brains of those who did not decreased. And this increase in volume correlated with an increase in memory. The mode of exercise will vary depending on the stage of dementia and the person’s level of physical fitness. Be sure to check with their primary health care provider before beginning a new exercise regime. If your parent has never been exercise-oriented, consider setting up an appointment with a physical therapist who can help them begin. Exercise offers more than just the traditional benefits of exercise such as improving circulation, keeping muscles and bones strong, and reducing the risk of diseases such as some cancers, stroke, diabetes and heart ailments to those suffering from dementia. It maintains good blood flow to the brain and stimulates new cell growth. Exercise has been found to decrease the frequency of wandering, behavior issues and sleeping disorders. It is a great stress reducer which is vital to those with this disease who can become easily agitated. Walking. Sometimes the simpler is really the better. Walking reduces stress, increases circulation, and provides mental and visual stimulation due to the various areas available for this activity. Consider walks in the neighborhood, in local parks, or through neighboring botanical gardens. If your loved one is uncomfortable in unfamiliar places, keep them in well-known surroundings. Start slowly and aim for at least 30 minutes of exercise 5 days a week. Bicycling. The rhythmic movement of bicycling can have a calming effect as well as aerobic and strength-building benefits. Performing the exercise on a stationary bike with their favorite music playing in the background is a good method of incorporating. Dance. The repetitive nature of this form of exercise and the need to remember various steps makes it a good exercise for both the body and the brain. Aquatic Exercise. Sometimes those with dementia enjoy the buoyant feel of water and the gentle effect it has on joints. These classes can often be found at your local Y. 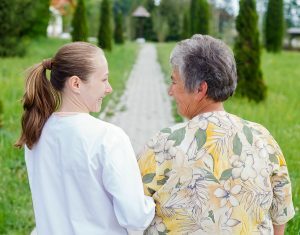 An elder care provider can assist your loved one with the daily activities of living as well as accompany them on their daily walks and to their exercise classes. Consider obtaining their services for just a few days a week early in your parent’s diagnosis so that they can get to know each other. Companionship is a vital component to your parent’s well-being and will grow in value. If you or an aging loved one are considering elder care in Keyport, NJ, please contact the caring staff at Lares Home Care 888-492-3538 or 732-566-1112.